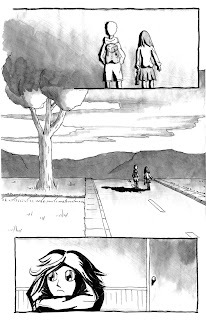 While at Odiyan in CA, I created a couple of pages for a graphic novel idea. They were used in a proposal for a larger work. Unfortunately things basically ended with that. Since the organization was non-profit, they were not receptive to the idea of any compensation for the work other than what I was already receiving. 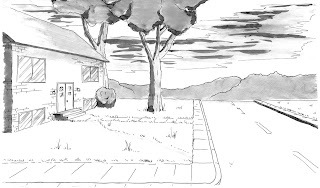 In any case, the first image above was the concept drawing for the setting of the story's beginning. Then you have the next page, which shows the initial characters, albeit briefly. Now, since these pages were created in manga style, you read them from upper right to lower left, though you don't have to worry about that on the first page. This is the second page, where the cell order is more important. It introduces another character, and establishes the basis of their relationship. I have considered continuing this story on my own, though I would have to obtain the book which contains the short stories that serve as the inspiration for it. Not that this would be difficult, but I wonder if I have the motivation and desire to undertake such a task. 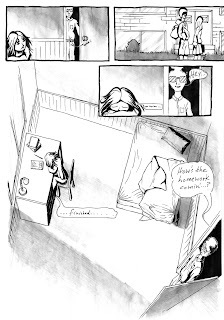 Still, it might be fun just to make a shortened version and do better quality inked pages of this. We'll see.